Todd is also the editor of the anthology Mendelssohn and His World (Princeton University Press, 1991). The book includes critical essays, letters from and to the composer, and excerpts from memoirs of his contemporaries. 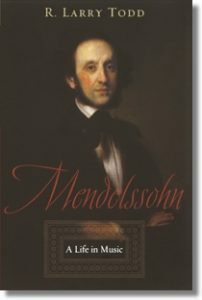 Here is an interview with R. Larry Todd about Mendelssohn: A Life in Music that was featured on volume 71 of the MARS HILL AUDIO Journal.